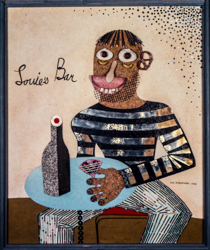 A tough sailor-type in a sleazy bar (named after himself as a Hirshman inside joke) with hair of nails, metal beard and a shirt so tight his manly body hair leave their impression through the cloth sits drinking his brew – from a cocktail glass? At least it is filled with cutting razor blades. Of note is the bottle with its cubist look, Hirshman’s first nod to likes of Picasso.